Frozen shoulder is a fairly common condition in the general population. It typically presents in people in their 50s and 60s. Women are more often affected than men. Basically, it means that your shoulder pain and stiffness is a result of shoulder capsule inflammation and fibrotic adhesions that limit your shoulder movement. The limitation in movement affects active and passive shoulder joint range of motion. That means that the movement in your shoulder joint is restricted both when you try to move your own arm and when someone else tries to move your arm for you. Virtually any shoulder condition which causes pain and therefore disuse of the shoulder can increase the likelihood of developing a frozen shoulder. A potentially preventable cause of frozen shoulder can occur post surgery. Patients who are overly protective of their arm and do not comply with their post-operative exercises increase their likelihood of developing a frozen shoulder. Some health conditions eg. diabetes also increase the risk of developing a frozen shoulder. Experts are not certain what causes frozen shoulder. The theory is that it develops from joint inflammation and scar tissue formation. 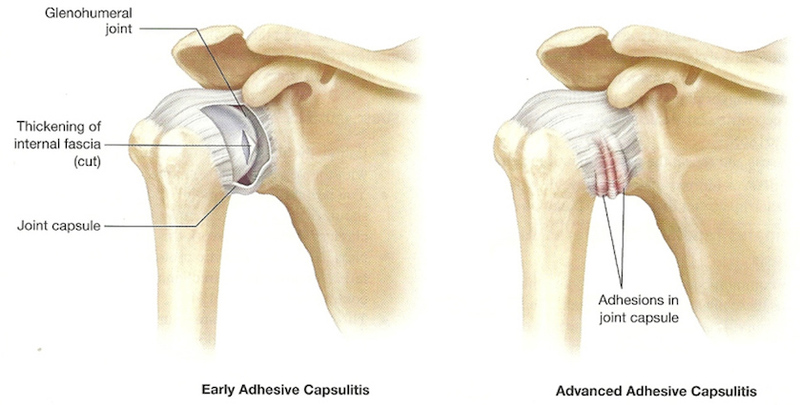 As this happens, the tissues inside the joint harden and shrink, making it more difficult to move the shoulder. Symptoms include pain and progressive loss of shoulder joint range, usually lasting 3-9 months. Largely reflected by stiffness, usually lasting 9-15 months. During this period range of movement gradually increases, usually over 15 to 24 months. Spontaneous resolution may occur at around 30 months. Frozen shoulder can be diagnosed clinically from your symptoms and via a thorough shoulder examination. Treatment is tailored according to what stage your shoulder is in. Pain relief and differential diagnosis are priority. Pain relieving techniques may include pharmacological medications as prescribed by your medical practitioner. Intracapsular corticosteroid injection may be considered in certain circumstances. Gentle shoulder joint mobilisation, soft tissue massage, stretching, dry needling and taping may all assist in reducing pain levels during this time. Gentle shoulder joint mobilisation, soft tissue massage, stretching and dry needling continue. Exercises to regain range and strength are now introduced. Hydrodilatation may be considered. A Hydrodilatation is a procedure that involves injecting saline along with cortisone and local anaesthetic into the capsule to expand and stretch the capsule in the aim of breaking down capsular scarring and adhesions. It is in this stage that you will begin to notice improvements. As your range of motion increases your strengthening exercises will be progressed accordingly. Can you prevent a Frozen Shoulder? Frozen shoulder caused by disuse can be prevented by avoiding long periods of immobility.